This rear load Bill Changer is designed to break larger bills into smaller bills of one denomination. Recommended for Car Wash and Laundry applications, it is designed with an Industry First Pull-Away Face Plate to minimize repair costs. Most ATMs dispense $20 dollar bills, yet nobody wants $20 worth of quarters or tokens. This machine eliminates your lost sales and attendant costs, driving up profits. 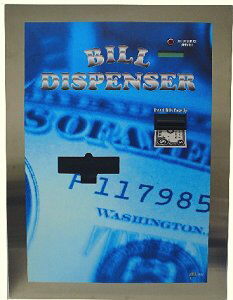 The bill dispenser in this multi-changers made by LG, one of the most reliable and reputable electronic companies of our time. The LG dispenser repays out "street grade" bills and does not require ATM quality bills.